Okay, so last week, I told you how excited I was to have my next craft fair lined up already, well this week, I am thrilled to tell you that I will be selling some of my collage pieces at the amazing A Steampunked Life store in Surry, VA! A Steampunked Life is a family owned and operated business. They have an amazing brick and mortar store not far from where I live, and spend almost every weekend of the year touring the country to sell at various craft fairs, comic cons, etc. I was lucky enough to meet the lovely Paige, JP and Blaise at the Steampunk, Visions Of Future Past fair a few weeks ago, and even luckier to be invited to bring some of my work to sell at their store! Can you imagine how big a confidence boost that is for me?! So yesterday, Brian and I went up to Surry to see Paige. Their shop is incredible! A treasure trove full of gadgets, fabulous clothing pieces, amazing jewelry, books, art pieces and more. We were also invited to tour the workshops in the back, and I am so jealous of all their space and storage. Their shop is my dream. 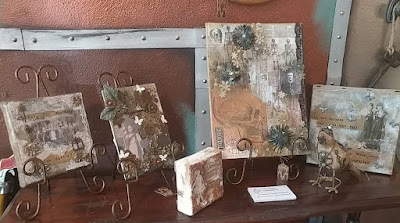 Most of the items for sale are made by the family, or by other local artists. And now I am one of those artists! I feel like a member of their family already, and it is such a wonderful feeling to connect with other supportive artists who appreciate your work and vision. You can find them on Facebook, HERE. And also on Etsy, HERE. Follow them on Facebook and Instagram @a_steampunked_life to see where they will be each weekend and stop on by if you are in the area! Gallopond Gallop Semper K9 5K Festival!